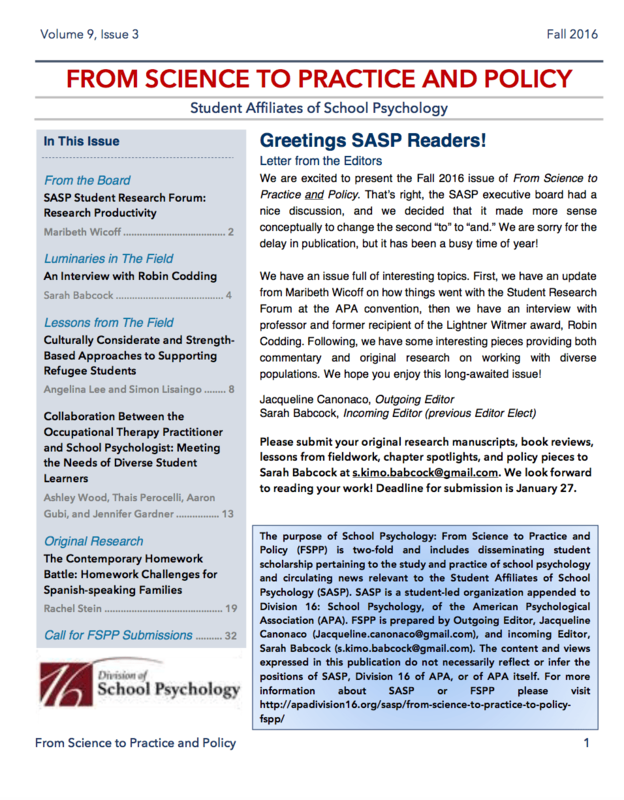 This is the periodical of SASP and features diverse columns authored by graduate students, interns, faculty and practitioners. Manuscripts are accepted on a rolling deadline, so submissions are welcome at any time. Please submit all manuscripts directly to the editor, Jacqueline Canonaco. Following submission, you will be informed of the acceptance status of your manuscript within two weeks. At this time, you may be asked to edit or revise your manuscript prior to publication. If you have any questions regarding the manuscript submission process or FSPP, please contact the Editor, Jacqueline Canonaco, or the Editor-Elect, Sarah Babcock. We also highly recommend reviewing our pre-submission checklist for manuscripts.